Why MEPs are dissatisfied with the candidates for the new European Commission? European Parliament conducted hearings of candidates for the new European Commission on October 6, and, according to many MEPs, this test was failed in some cases. Of course, it is difficult to imagine in politics full or close to that consensus. And particularly, it concerns our MEPs corps, given a width of political views and different party platforms presented in European Parliament. And yet, as if to justify, we could mention that selection process of candidates is influenced by the desire to observe some gender balance in the new composition of the European Commission. But all these arguments are not enough, and the composition of a new team of European Commissioners, unfortunately, does not reassure us in their abilities to solve the complex problems that they have to meet in the near future. 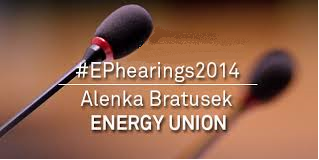 Probably, those who listened attentively to the records of three-hour Internet TV broadcasting of Hearings for Commissioners designate on June 6, , just like to me, it seemed that Mrs. Alenka Bratusek's speech who is proposed to the position of Vice President for Energy Union, was particularly unconvincing. One of the first questions to Mrs. Bratusek put by MEP Marek Grobarczyk from European Conservatives and Reformists Group was related to a widely known issue about where the European Union can obtain gas supplies in case of replacement of gas from Russia, if the Commission implements its intention to reduce EU dependence on Russian gas. To everybody's disappointment, the answer was very general, and too short especially with regard to possible changes in the geography of gas supplies. In answer, Mrs. Bratusek stated that, in the short term it was expected to replace Russian gas with the supplies "from Norway and from the side of Mediterranean Sea." Such an answer, obviously, was one of the reasons for the disappointment in the audience comprised of rather informed MEPs who even urged several times Mrs. Bratusek to answer more specifically. However, real Norwegian capabilities reveal the converse. No doubts that many of the MEPs should be aware of Norway opinions on this particular issue. Back in June of this year, the Norwegian company Statoil announced that it would be unable to replace Russia in the European gas market. In an interview published by Reuters CEO of Statoil Helge Lund argued that the company could increase somewhat (supplies – ed.) but it could not replace Russian gas. And over the past few months after this statement Statoil position has not changed. Moreover according to the data of 8 months of this year, there was a reduction of the Norwegian gas deliveries to the EU by 4 bcm. In addition Statoil has made a new gas discovery in the Pingvin exploration area in the Barents Sea. According to Statoil estimates the volumes in Pingvin to be in the range of 30-120 million barrels of recoverable oil equivalent. But the discovery is currently assessed as non-commercial. Thus, there are no real grounds for the proposal of Mrs. Bratusek regarding possibilities to displace Russian gas from EC market by the northern gas supplies from Norway. The prospect of extending the south direction of gas supplies in particular from the Mediterranean area is meeting with a number of problems as well. But this topic definitely deserves a separate discussion, and we will come to it more than once again. Much to everyone's dismay, there were many other incompetent answers. Assessing in overall the speech of Mrs. Bratusek at the hearing in the European Parliament, MEP Claude Turmes from the Group of the Greens/European Free Alliance argued that "the Energy Union, climate change - it requires a leadership, and we saw something completely different. There was no leadership, but just attempts of hiding behind the Articles of the EU Agreements... This is the end of progress in EU policy on energy and climate change". As a result some days later The Parliament rejected Alenka Bratusek by 112 votes to 13, after she faced a strong criticism that she wasn’t up to the job of becoming the EU’s first-ever Vice President for Energy Union. However in addition to reasonable concerns about our future energy well-being, which certainly our Europe and its citizens deserve to be better than now I have got a feeling that, unfortunately, our highest leaders are getting farther from a reality, carried away by political ambitions and globalist policies. Now we have to focus on the question for who is it necessary to set up on the starting line of a new challenging phase of our European integration so much an inadequate team? And why should an essential level of energy security required actually for each European citizen be hold hostage because of this obvious incompetence?